If you are an app marketer, chances are that you may have found yourself entangled in a similar web of confusion at one time or another. App user engagement is a cause of concern for many marketers. Even though there are numerous engagement tactics that can be put into action, there’s nothing that compares to push notifications to keep an app user engaged. Unfortunately, push notifications are under a dark spell. That’s because most brands that use push for engagement have a record of inundating the user’s smartphone with a bevy of notifications, eventually forcing them to either opt out or uninstall the app altogether! You’ve done it in the past, and we’ve done it too. It’s a significant loss of opportunity for marketers. Push notifications are a direct channel for a conversation with a user, and unlike emails or messages they aren’t forgotten, ignored, archived or deleted as much. Given that it has become easier for users to opt-out of push notification, understanding its dynamics has become more important than ever for app businesses. The Current State of Mobile Push Notification – What Your Users Really Want? Before we discuss the current state of mobile push, it is important to understand how users engage with mobile apps today. That’s because the app craze isn’t the same that it used to be. App users have become extremely selective. Now only a smaller number of apps command a majority of all engagement. A report by ComScore on Mobile user engagement and behavior found that roughly 80 percent of smartphone app time is spent by users on top three apps even though people typically engage with 25 apps per month. 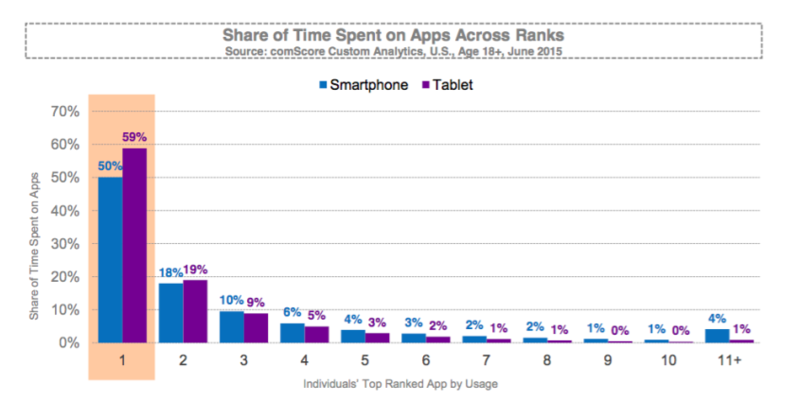 The report also mentioned that half of all time spent on smartphone apps occurs on an individual’s top app. With a very minuscule window left for engagement, Marketers should be able to plan their push notification strategy in a way that’s pleasing and not annoying, offers mutual value to the user and the brand and lastly makes them stay with the app. To be able to achieve this feat, it is critical to be aware of user behavior, trends in app industry and how it impacts push notifications along with the end expectation of a user from this marketing channel. Andrew Chen makes a few strong points about push notifications in the video below. He says that the data around push notifications is mysterious and there’s huge difference in the CTR from one app industry to another. He further states that most marketers use a generic approach while implementing their push strategy thereby negatively impacting their CTR. To make sense of it all, we’ve listed a few points that are pivotal and need understanding before you revamp your push notification strategy. Most app marketers make the mistake of seeking push notification permission as soon as the user onboards the app. We see this same problem in the ask for push notifications on websites. This is a recipe for disaster. Onboarding is the time when users are getting to know your app and exploring its features. Therefore, they may end up ignoring the opt-in notification if it is presented too early in your relationship with them. Similarly, the attempt of seeking permission immediately after onboarding may come across as ‘invasive’ to others. They may assume that this step is a reflection of your entire ‘push strategy’ and decide to opt-out immediately. Users should be able to trust your app before they see value in the notification offered to them. 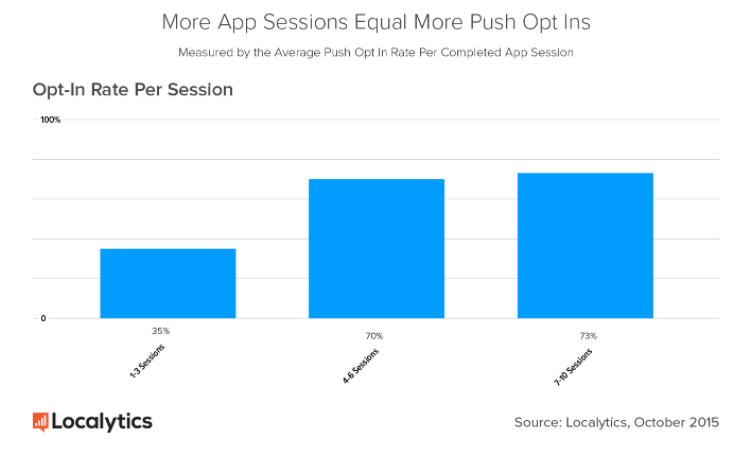 Localytics did a study and found that users who complete between 1 and 3 sessions in an app have an average opt-in rate of 35% and the rate doubles when users complete 4-6 sessions in an app. This is a nagging ask in the mind of every app marketer we know. Thankfully we have the answers. 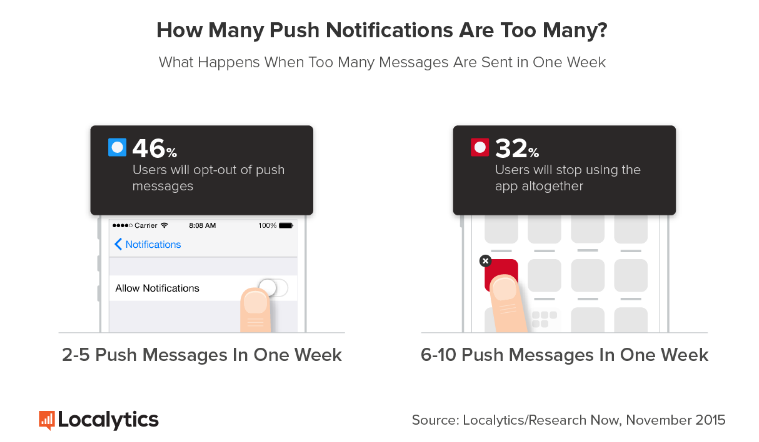 Localytics found that users prefer fewer push notifications in one of its studies. In one of its survey, 46% of respondents said that they would disable notifications if they received between 2-5 messages/week, whereas for 32% of users will stop using the app altogether if this number ranged between 6-10 messages/week. Finding the ideal push notification ‘number’ thus becomes a critical step in defining how your users will respond to your messages. A survey by Appboy evaluated the various reasons users choose to opt back for push notifications. They found out that 29.4% would do so if they received appealing messages through other channels. A coordinated multi-channel messaging strategy including in-app messages, emails, social media, and news feed cards works to win back customers. By introducing a strategy like this from the very start marketers can showcase consistent value and relevance to their users while also minimizing push-opt outs. Most apps today use tutorials as a part of their onboarding flow. Such content is high- value for the users given that they are still warming up to the app helping them learn more about its features and how to use them. By introducing the real value of push during onboarding, marketers can subtly pre-sell users the value of opt-in when asking for permission later. An example of this strategy is the Grouper app. 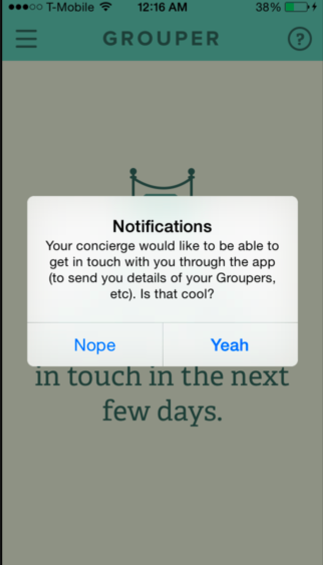 The Grouper app seeks opt-in permission from its users at the end of its onboarding process. Until then the dating app allows its users to settle in with its step by step tutorial. Once the user has reached the end of the onboarding flow the app shares a well crafted ‘push notification permission’ showcasing its real value. Unlike generic permission messages, this tailored message not only states the purpose of seeking push permission but also does it in a way that can’t be ignored. Seeking opt-in permission immediately after onboarding won’t do much for your push strategy given that most users relate push notifications with promotional content and usually want to stay away from them. 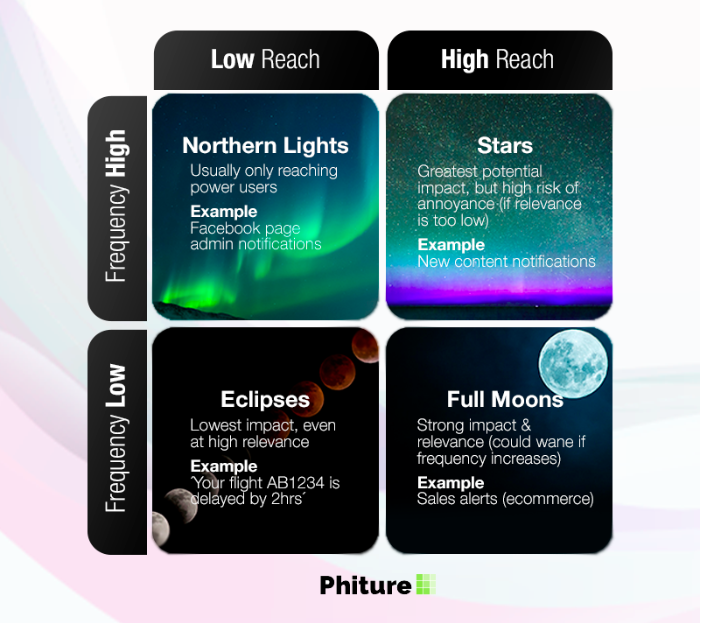 Andy Carvell, Co-Founder of Phiture and Ex-Growth Head of Soundcloud, has developed an ingenious framework for notifications which he describes in length in this fantastic article. Andy explains that the reach and frequency of notifications dictate their potential for impact, a significant factor while crafting a push notification strategy. He uses this astrological analogy to classify different types of notifications. “The more relevant and interesting the notification is, the higher the likelihood that the user will engage with it positively and the greater the desired impact. Users’ tolerance for frequency of notifications is directly proportional to the relevancy of the notifications; if notifications are relevant enough, the volume of notifications can be increased without negative effects (e.g. opt-outs, complaints or churn). Warning: The converse also applies! Another way of winning with push notification is by using personalization. Unfortunately, marketers seem to be stuck with the generic broadcast method. A study done by Delvv found out that 78% users feel that they get irrelevant push- a direct outcome of using a broadcast strategy. On the other hand, the value of personalized push is varied. A study conducted by Localytics proves that people want personalized and relevant push notifications to stay hooked onto an app. In the study, 48% of users picked personalized, relevant push messages over new content and special offer messages basis their location more appealing. 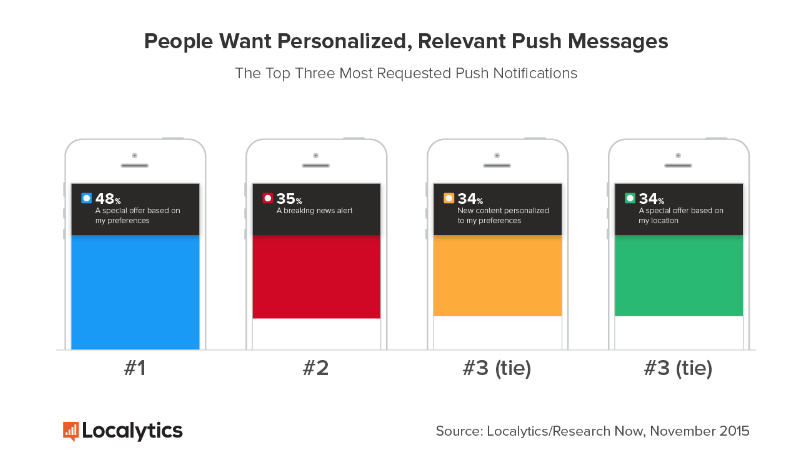 Personalized push notifications were also found to have 3X the conversion rate of the other messages. By sending notifications based on a user’s past search history, location and available personal data, marketers add a lot of value to a user’s interaction. As marketers, we need to constantly think of out-of-the-box tactics to be able to appeal to our users. Given that push notification opt-out has become relatively easy app marketers need to add marketing hacks to their arsenal to encourage more users to stay put with push notifications. One such hack is incentivizing users when they choose the opt-in feature. Incentives can be in the form of app only purchases, discounts, money off, etc. What users expect from push notifications is a debatable topic and often attracts two different viewpoints. Some value it as a channel and some do not. By incorporating a few basic tactics like the ones mentioned above, marketers can still provide value to users those who favor push notifications (almost 50%). At the same time, marketers should be aware that no mobile marketing strategy is foolproof and is dependent on numerous factors to make it work. App marketers are finding creative new ways of using push notifications each day. However, the real challenge lies in harnessing this creativity in a way that stays memorable in the mind of users. Apart from being able to use user information from the app (location, in-app preferences, etc. ), marketers can benefit from combining this information with the user’s psychology. This will not only help them in creating copy that is exceptional but also that catches the user’s eye instantly. Humor is a great tool to keep users engaged. Postmates shows how to use it in their push notification copy. On Pi Day they sent quite an amusing push notification to its users. Copy that has an element of suspense or which piques a user’s curiosity is bound to do well because it is human of us to want to know everything. A good example of this is a push message sent by Abercrombie. The copy works as a cliffhanger enticing the user swipe instantly. One of the most significant reasons why users opt-in for push notifications is to be able to get important information from the app when it matters the most. For example, when a product is back in stock or when the cost of a ticket is going down. The Hopper app has a pretty slick push notification strategy. The app analyzes flight prices daily to predict how prices will change and when is it ideal to buy the tickets. 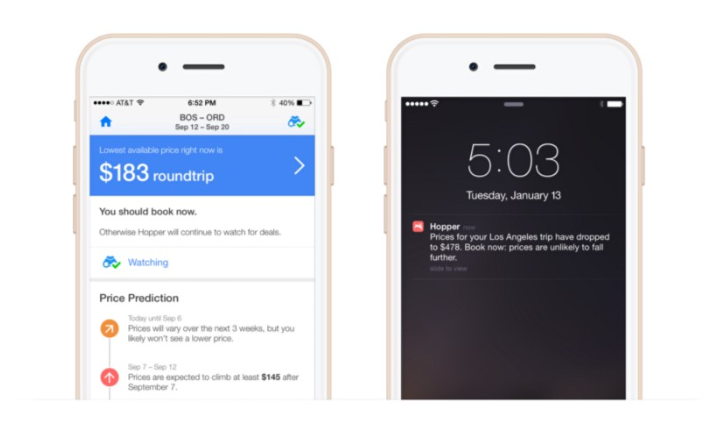 The app sends a push notification to users as soon as it hits a ‘good-deal’ range. We want things most when we are told that we cannot have them. This is reverse psychology at its best. The same principle can be applied to push notifications as well. Apps like MyFitnessPal and Duolingo have used it successfully to increase user engagement of their app. Building trust in the mind of a user isn’t easy, more so for app marketers in the E-commerce space. Many users still think twice before using a credit card to make an app based transaction due to trust issues. That’s where LevelUp does an excellent job of building and maintaining trust. The app sends a push notification to the user as soon as they make a purchase along with its transaction details. Such push notifications act as a confirmation and encourage the user to make additional transactions without any fear. Building an exceptional push notification strategy is incomplete without the right tools at hand. With a plethora of options available it can get pretty confusing to choose the best for you app business. That’s why we’ve listed the one that have a proven track record and are backed by app marketers like you. Localytics is one of the most valued mobile engagement tool for app marketers. The product offers push notifications alongside other features such as in-app messages, inbox content and remarketing, as a part of its larger engagement suite. Marketers can pick from a vast variety of push types such as rich push, geo-fenced push notification as well personalized push to create exceptional campaigns. Just like Localytics, the push notification tool offered by Urban Airship is a part of its broader engagement solution and offers similar features and a variety of push. Appboy offers push notifications a part of its mobile marketing toolkit alongside features such as in-app and in-browser messages, email, webhooks and news feed cards. Kahuna is a cross-channel marketing automation tool which offers push notifications alongside numerous other marketing features. Mixpanel offers push notification for both mobile and web platforms. Its unique scheduling feature is a well-thought addition to its offering. Mixpanel also allows marketers to A/B test and send behavior based push notification to their users. Swrve offers a WYSIWYG mobile screen editor to run push notification campaigns. Marketers can also set and track their campaign goals using this tool. Now that you’ve understood a user’s expectation, evaluated various tactics to win them over and screened the available tools to build an effective push notification strategy, it’s time to dive into the final but important element bit – writing a copy that converts. Composing a message in fewer words that instantly grabs a user attention is not everyone’s strength. In order to succeed either hire an experienced copywriter or borrow a resource from your content team with skills in messaging. Here’s a list of do’s and don’ts that they need to know before they get started. Incorporate human emotions while writing the copy. Sound helpful, funny and be clear in your words. Do a reverse take on emotions and create fear and mystery in your copy. Write short and crisp copy and make your point instantly. It is important to tighten text so that the user can see an instant value in your message. Plan the personalization bit. Consistently share data with your content teams so that they can put it to use while crafting messages. Check push notification copy for spelling and grammatical errors. Use emoticons for visual effects where appropriate. Emojis boost push notification open rate by 85%. Use punctuation to create awe and surprise. For example, ellipsis has a luring effect on a user’s mind – see the Abercrombie example above. A/B test your push notification copy and improvise accordingly. 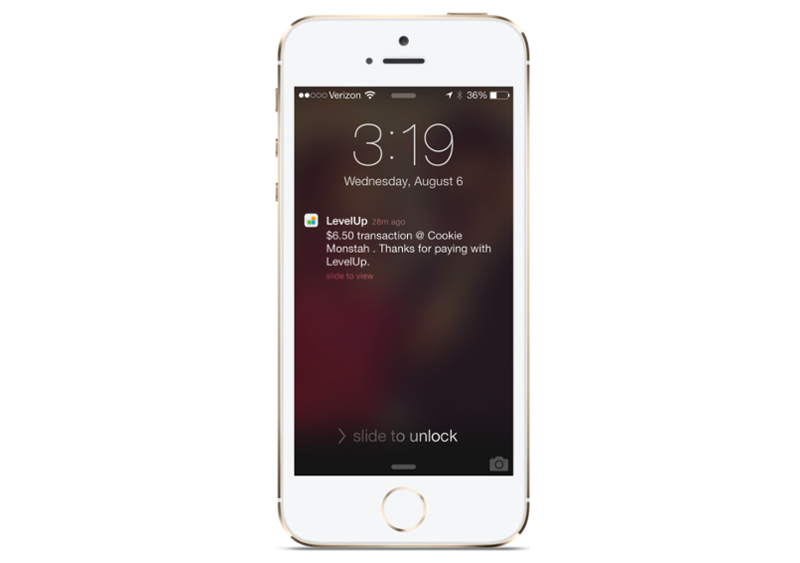 Evaluate your competitor’s push notifications. See what they are lacking and bring the best within your copy. Stay consistent with your brand voice and tone. Stay clear of lengthy copies. Copies with 21 words or more have a lower click rate (3.2%). Stay clear of offensive emojis. Draw the line when experimenting with humor. Do not go overboard with it. Be extremely cautious while writing copy that is debatable or follows a breaking news format. Don’t sound domineering in your copy. Be welcoming, thoughtful and kind. Double check offer details if writing a copy that promotes one. You may miss critical details which can create confusion for your users. Do not ignore the data while writing copies. This may lead in creating copy that is way too generic. Don’t dilute your brand’s voice, while writing the copy. It’s important that your brand’s voice remains consistent across all platforms including push. Don’t use a lingo that doesn’t resonate with your audience. Don’t be vague in your copy. Push notifications are a building block of every mobile engagement strategy albeit with a personality of their own. Even though they are often termed invasive and annoying marketers can change a user’s outlook by making effective changes to their push notification strategy and by including push notifications as part of a multi-channel communications strategy. User opt-in for push notification is a high-value currency that takes an effort to earn especially when more than 60% of users opt-out of it. What have you done to improve your strategy? Do share with us in the comments below! Wow, it’s a great blog. Tips to personalize push notification are awesome. However, I would like to add one more point. Using Big Image/Large Image notification also helps to increase CTR.It not only boosts customer engagement but it also grabs customer’s attention easily and manages to get prompt action. But this does not work well with all the industries. We have done a study which gives industry wise result. You can click on the link below to know the results.